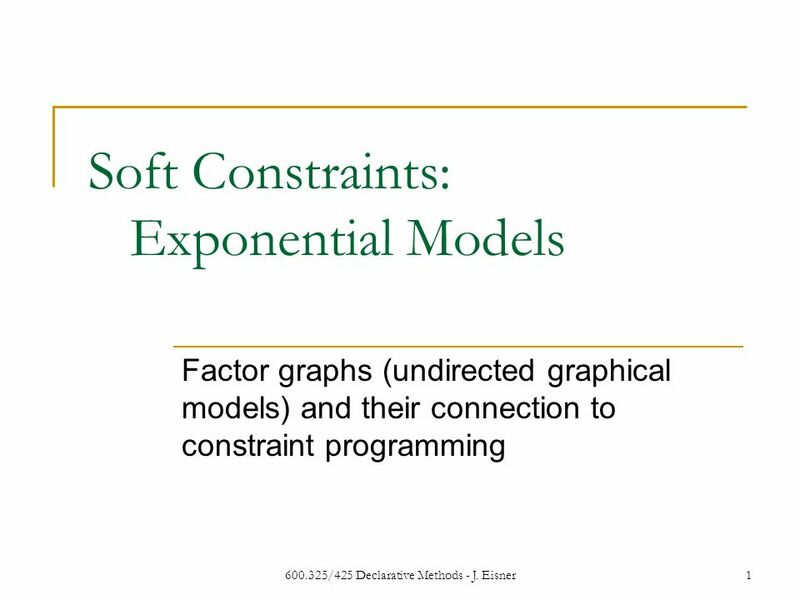 600.325/425 Declarative Methods - J. Eisner1 Soft Constraints: Exponential Models Factor graphs (undirected graphical models) and their connection to constraint. 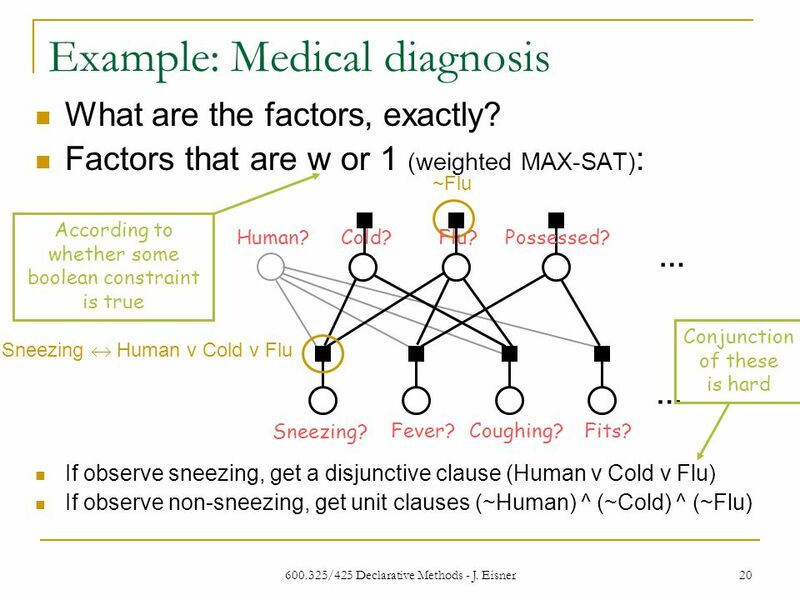 2 600.325/425 Declarative Methods - J. Eisner 2 Soft constraint problems (e.g, MAX-SAT) Given  n variables  m constraints, over various subsets of variables Find  Assignment to the n variables that maximizes the number of satisfied constraints. 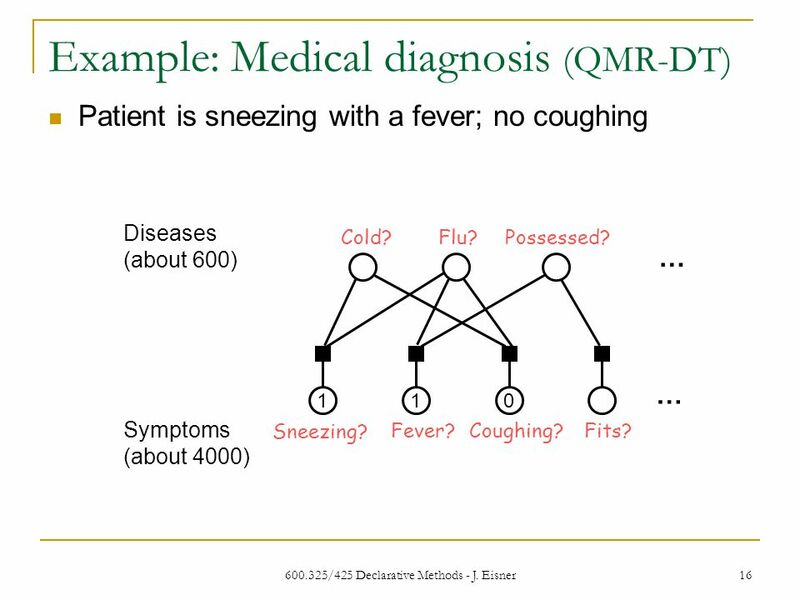 3 600.325/425 Declarative Methods - J. Eisner 3 Soft constraint problems (e.g, MAX-SAT) Given  n variables  m constraints, over various subsets of variables  m weights, one per constraint Find  Assignment to the n variables that maximizes the total weight of the satisfied constraints. Equivalently, minimizes total weight of violated constraints. 4 600.325/425 Declarative Methods - J. Eisner 4 weight w  if satisfied, factor=exp(w) if violated, factor=1 Draw problem structure as a “factor graph” figure thanks to Brian Potetz variable binary constraint unary constraint ternary constraint Measure goodness of an assignment by the product of all the factors (>= 0).  How can we reduce previous slide to this? There, each constraint was either satisfied or not (simple case). There, good score meant large total weight for satisfied constraints. 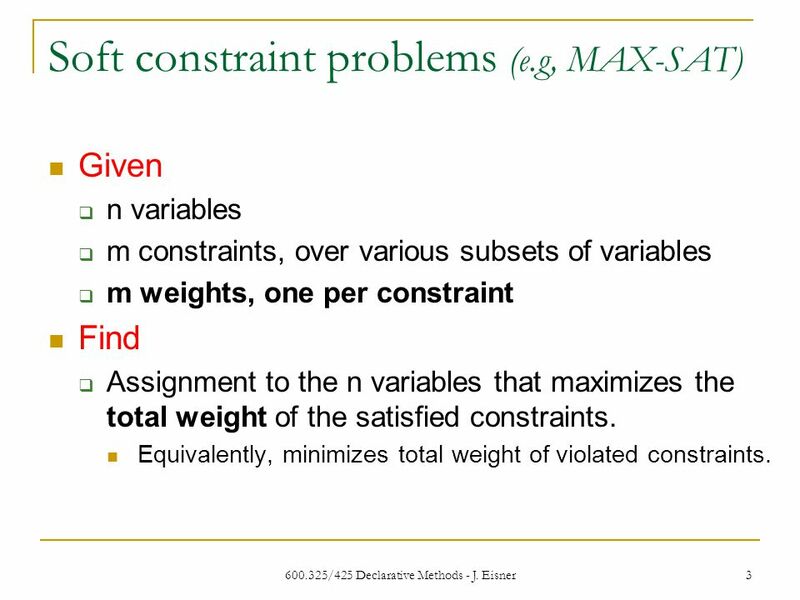 Each constraint (“factor”) is a function of the values of its variables. 5 600.325/425 Declarative Methods - J. Eisner 5 weight w  if satisfied, factor=1 if violated, factor=exp(-w) Draw problem structure as a “factor graph” figure thanks to Brian Potetz variable binary constraint unary constraint ternary constraint Measure goodness of an assignment by the product of all the factors (>= 0).  How can we reduce previous slide to this? There, each constraint was either satisfied or not (simple case). There, good score meant small total weight for violated constraints. 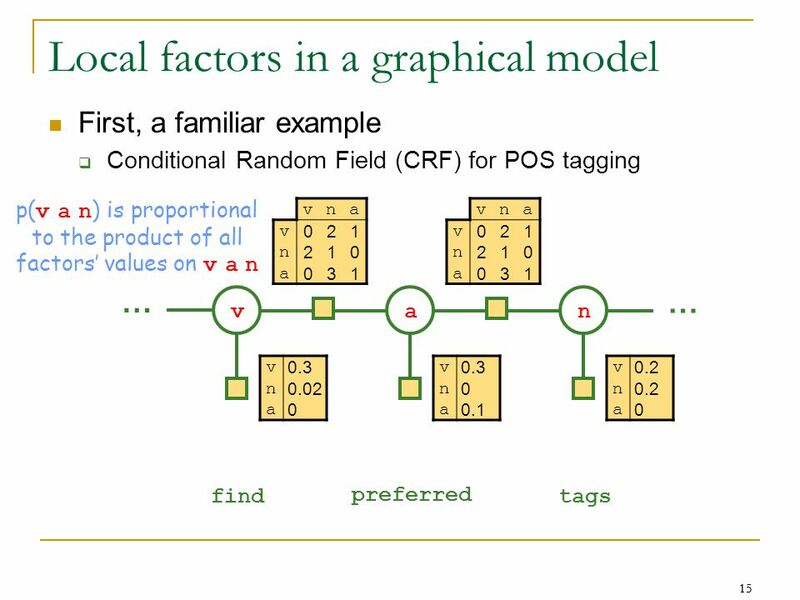 Each constraint (“factor”) is a function of the values of its variables. 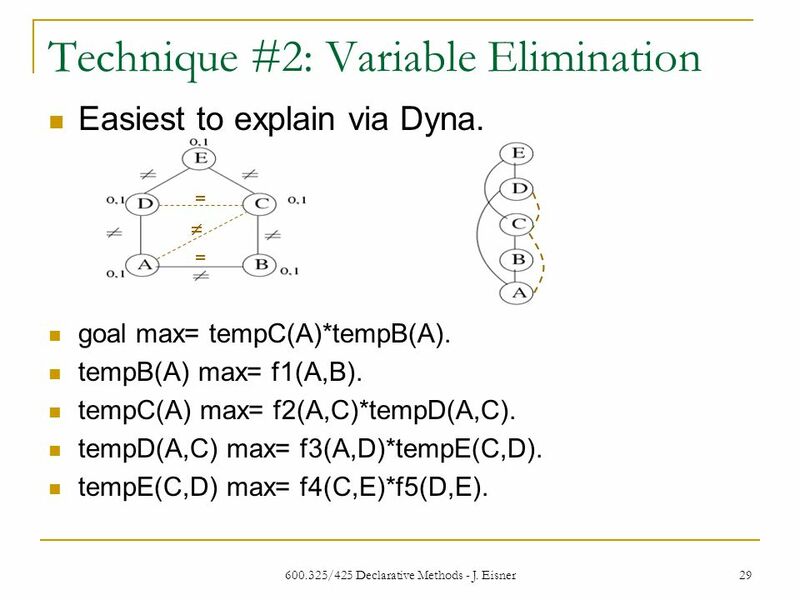 6 600.325/425 Declarative Methods - J. Eisner 6 Draw problem structure as a “factor graph” figure thanks to Brian Potetz variable binary constraint unary constraint ternary constraint Measure goodness of an assignment by the product of all the factors (>= 0). Models like this show up all the time. 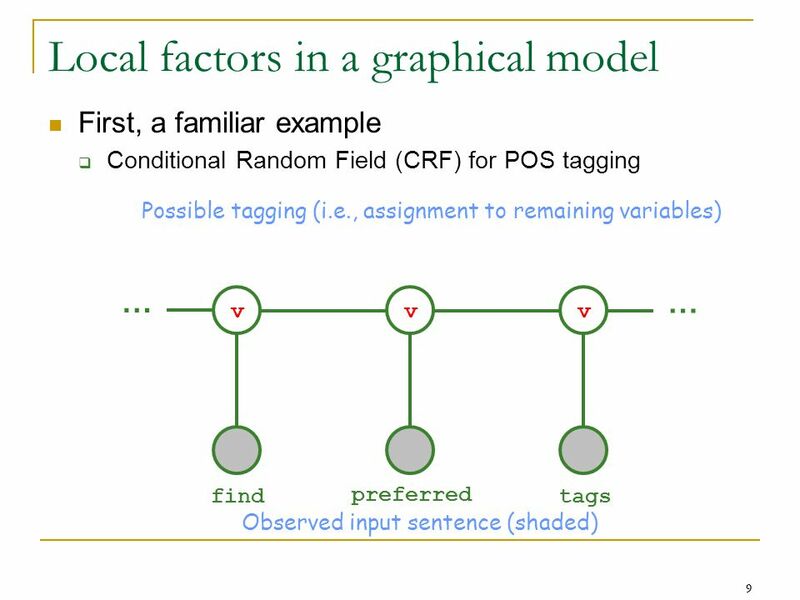 Each constraint (“factor”) is a function of the values of its variables. 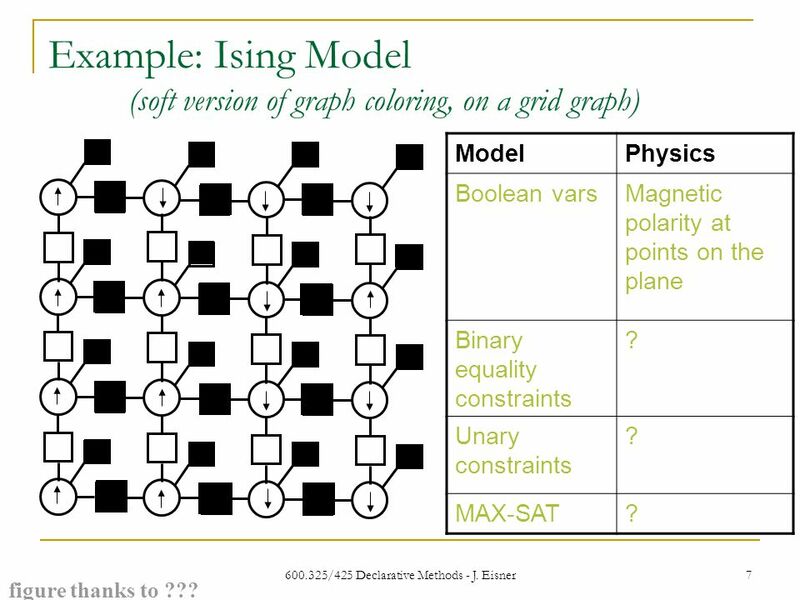 7 600.325/425 Declarative Methods - J. Eisner 7 Example: Ising Model (soft version of graph coloring, on a grid graph) figure thanks to ??? ModelPhysics Boolean varsMagnetic polarity at points on the plane Binary equality constraints ? Unary constraints ? MAX-SAT? 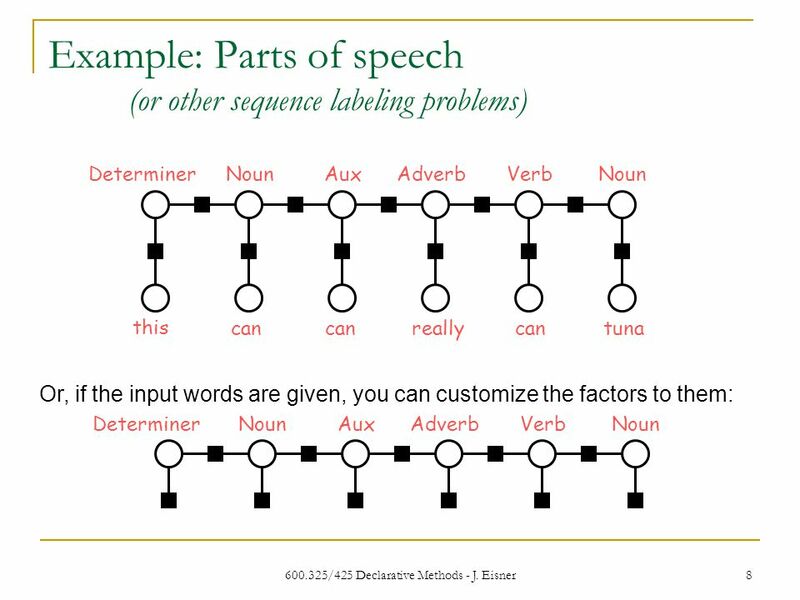 19 600.325/425 Declarative Methods - J. Eisner 19 1 Human? 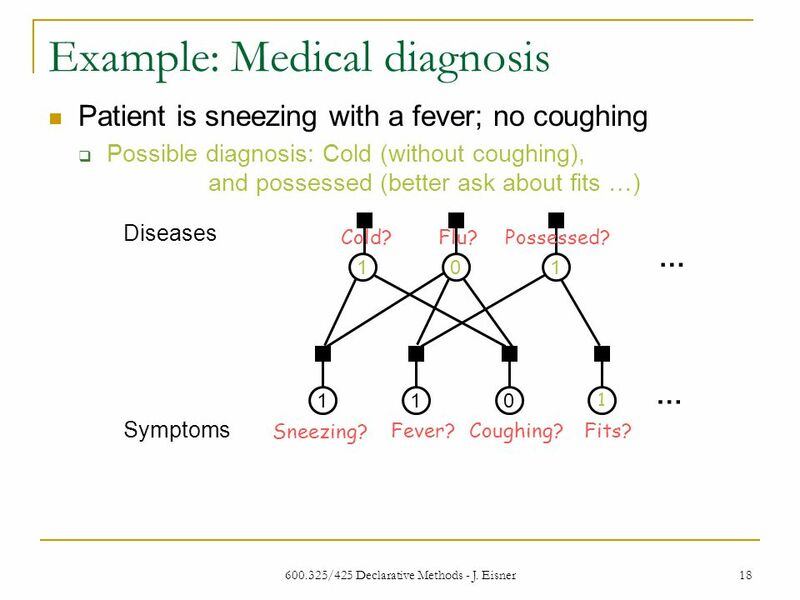 Example: Medical diagnosis Diseases 110 Sneezing? Fever?Coughing? 1 Fits? Symptoms 01 … … Cold?Flu?Possessed? 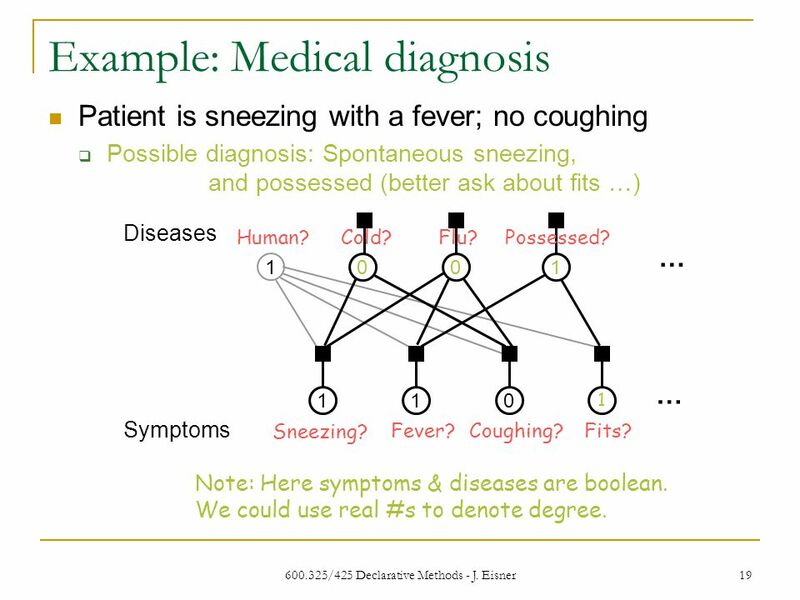 Patient is sneezing with a fever; no coughing  Possible diagnosis: Spontaneous sneezing, and possessed (better ask about fits …) 0 Note: Here symptoms & diseases are boolean. We could use real #s to denote degree. 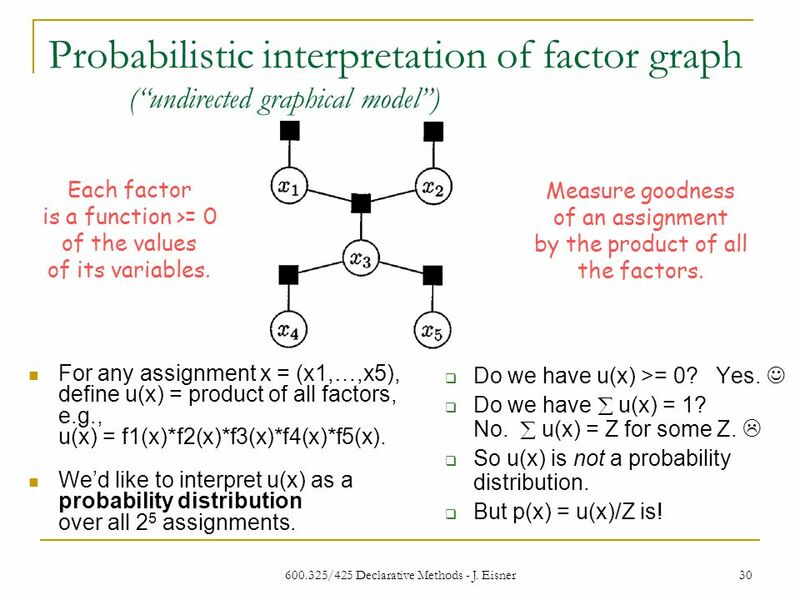 30 600.325/425 Declarative Methods - J. Eisner 30 Probabilistic interpretation of factor graph (“undirected graphical model”) For any assignment x = (x1,…,x5), define u(x) = product of all factors, e.g., u(x) = f1(x)*f2(x)*f3(x)*f4(x)*f5(x). 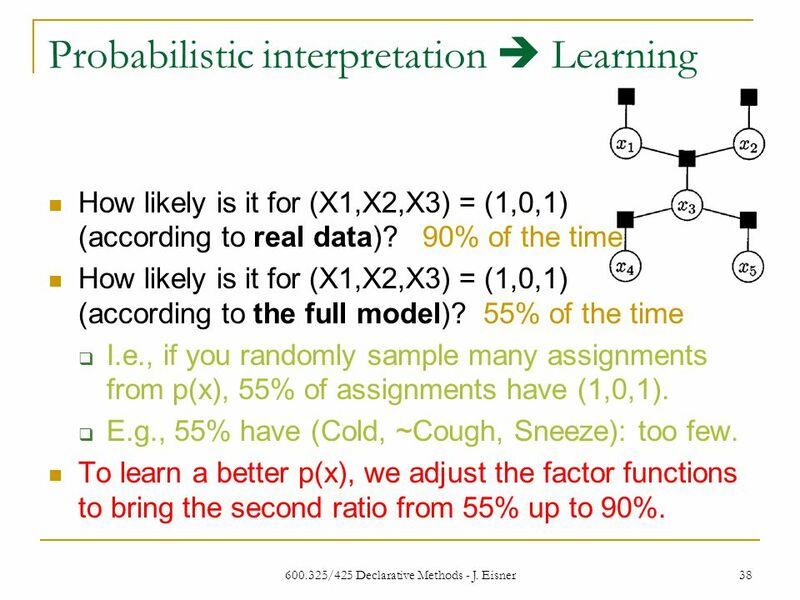 We’d like to interpret u(x) as a probability distribution over all 2 5 assignments.  Do we have u(x) >= 0? Yes.  Do we have  u(x) = 1? No.  u(x) = Z for some Z. 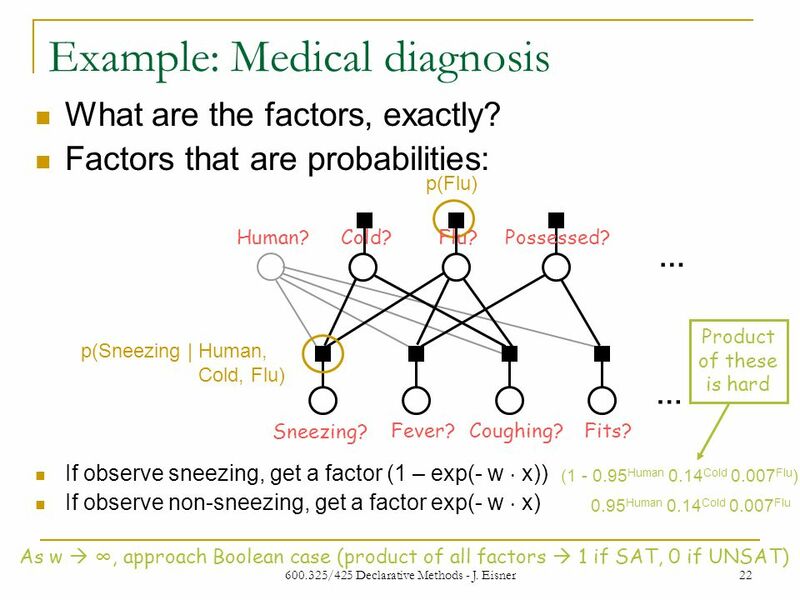   So u(x) is not a probability distribution.  But p(x) = u(x)/Z is! Each factor is a function >= 0 of the values of its variables. Measure goodness of an assignment by the product of all the factors. 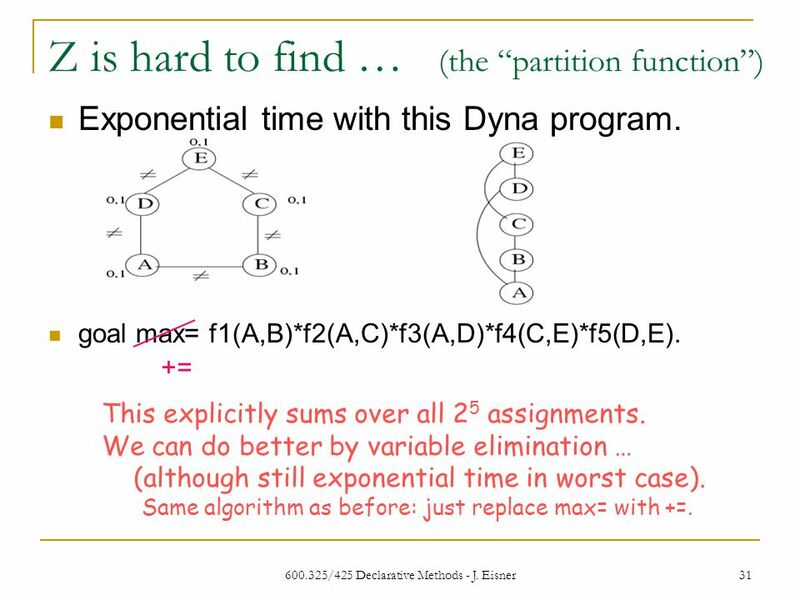 31 600.325/425 Declarative Methods - J. Eisner 31 Z is hard to find … (the “partition function”) Exponential time with this Dyna program. goal max= f1(A,B)*f2(A,C)*f3(A,D)*f4(C,E)*f5(D,E). 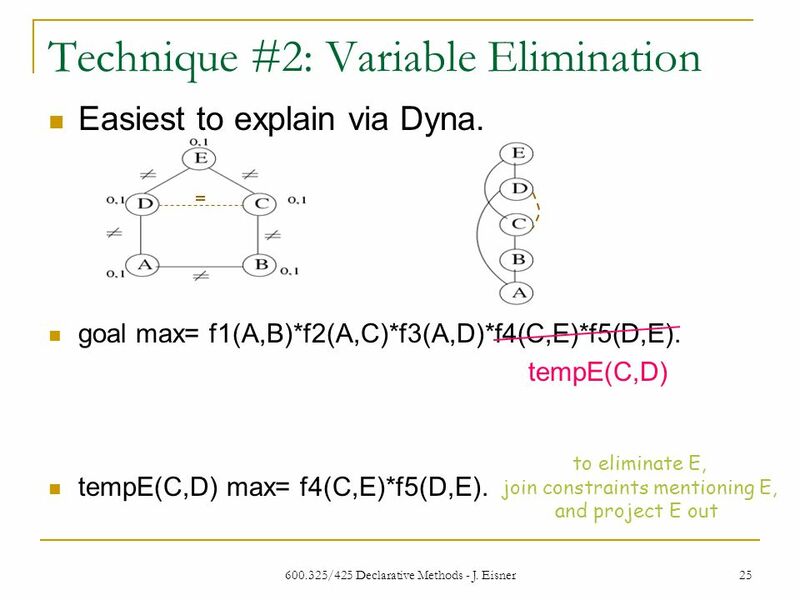 += This explicitly sums over all 2 5 assignments. 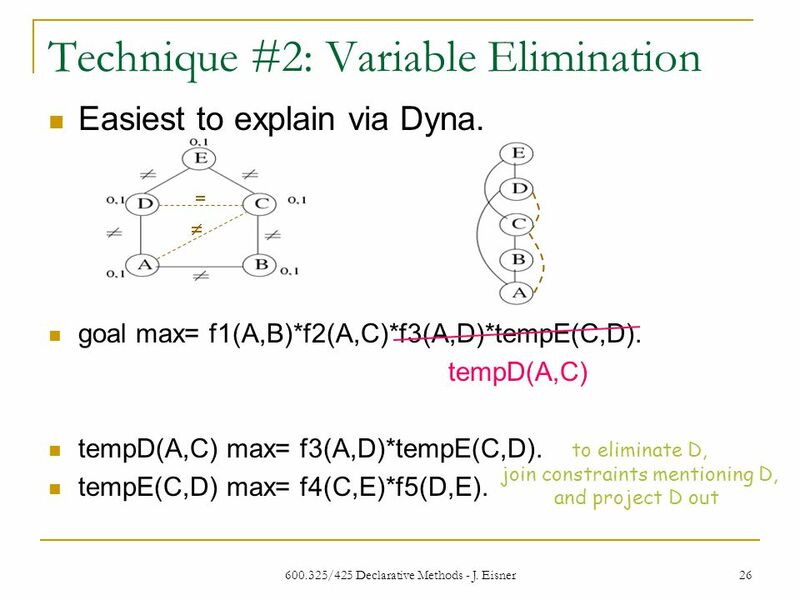 We can do better by variable elimination … (although still exponential time in worst case). 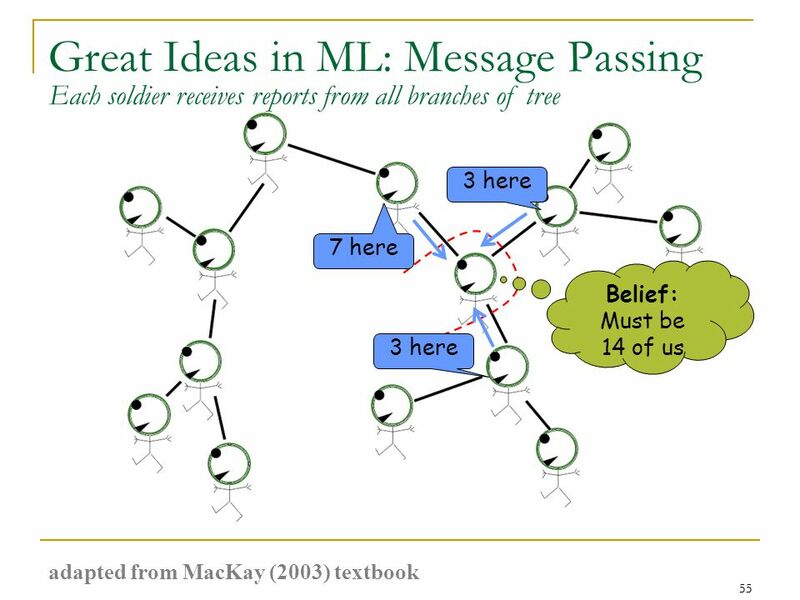 Same algorithm as before: just replace max= with +=. 33 600.325/425 Declarative Methods - J. Eisner 33 Why a probabilistic interpretation? 1. Allows us to make predictions. 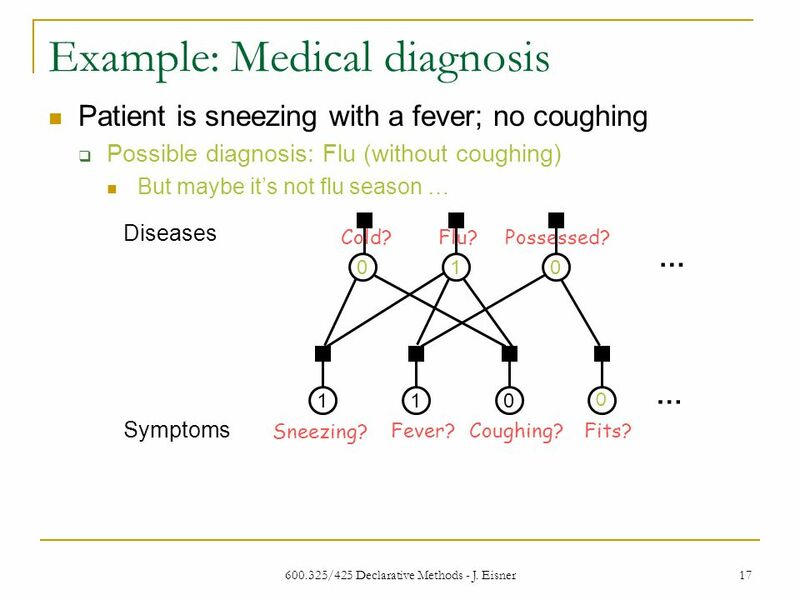  You’re sneezing with a fever & no cough. 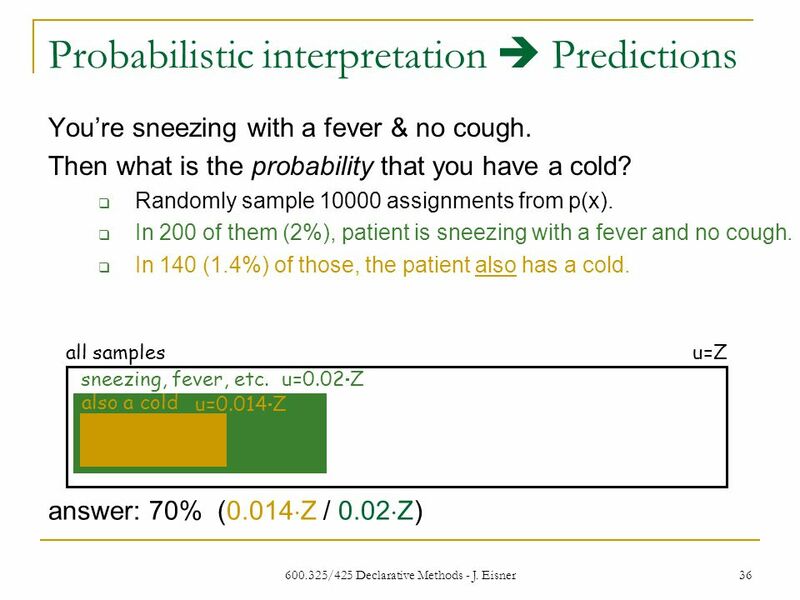  Then what is the probability that you have a cold? 2. 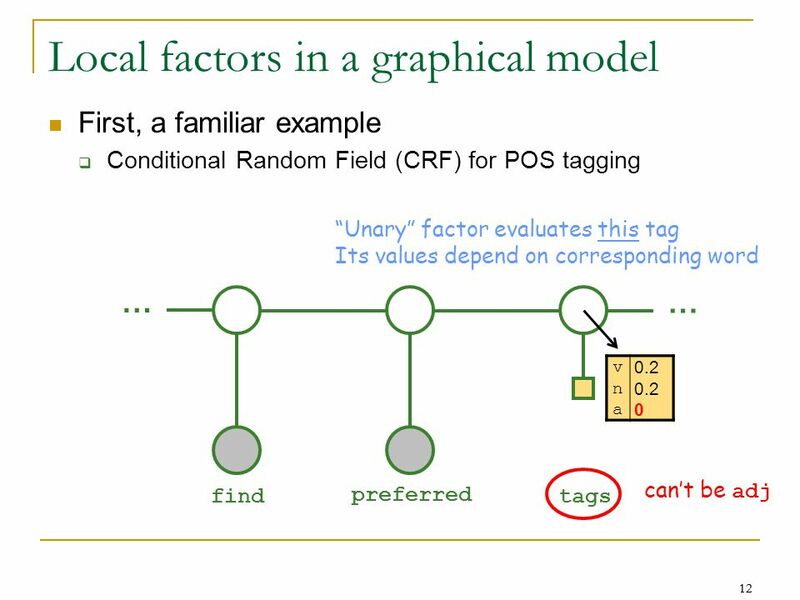 Important in learning the factor functions. 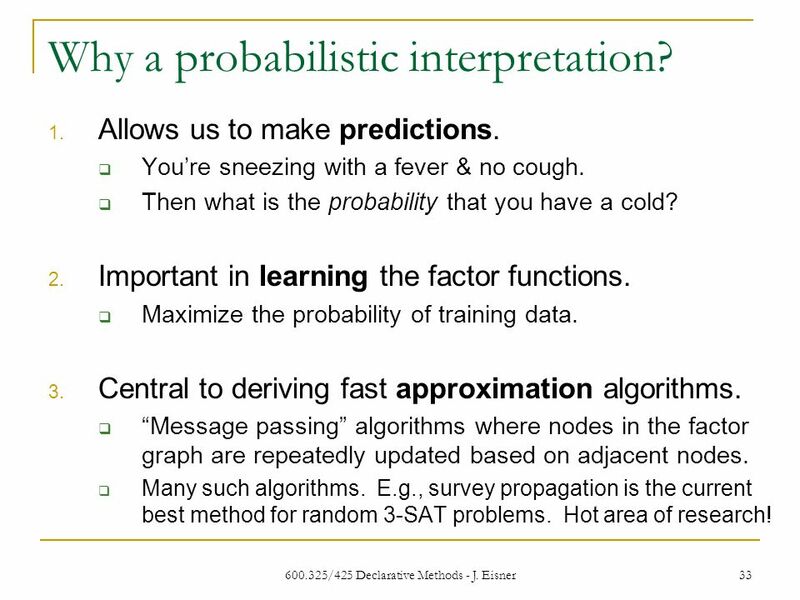  Maximize the probability of training data. 3. 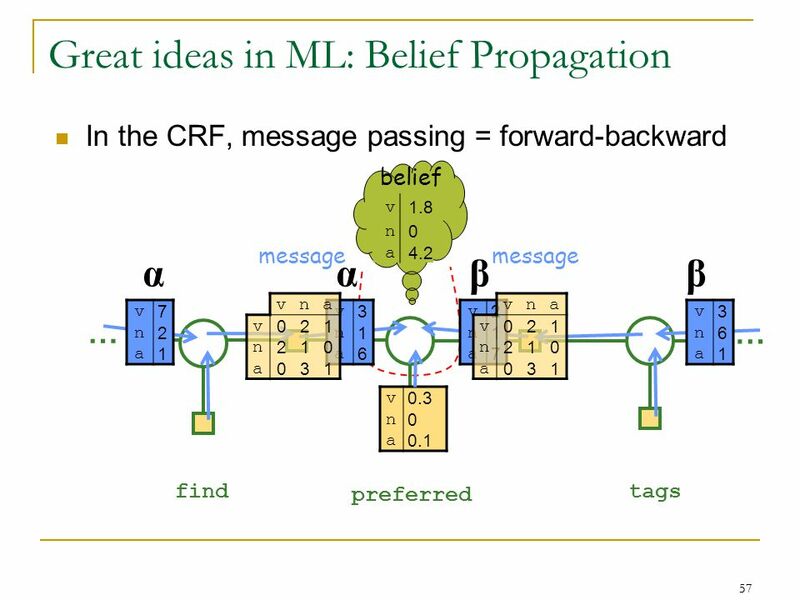 Central to deriving fast approximation algorithms. 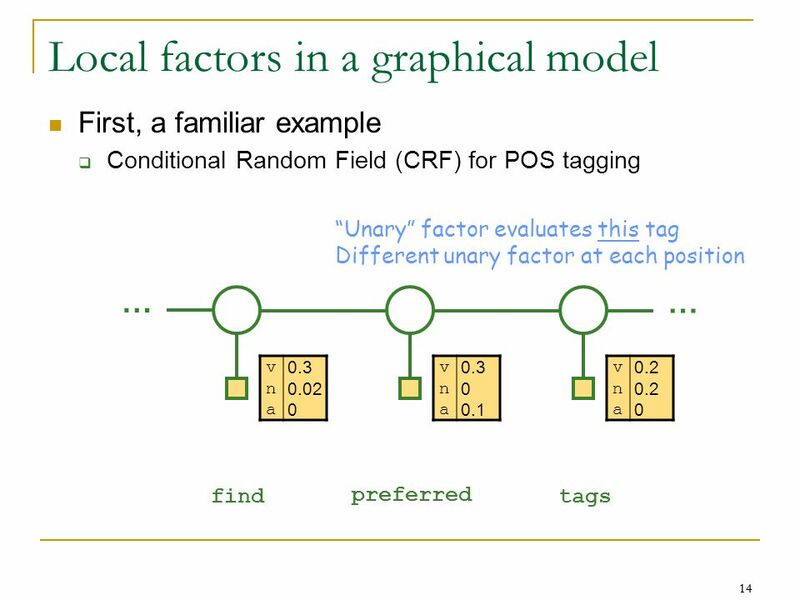  “Message passing” algorithms where nodes in the factor graph are repeatedly updated based on adjacent nodes. 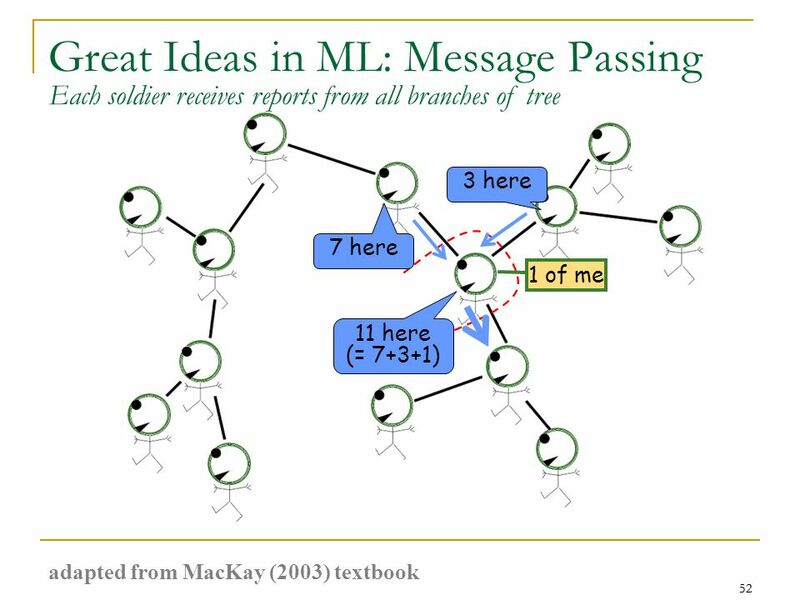  Many such algorithms. 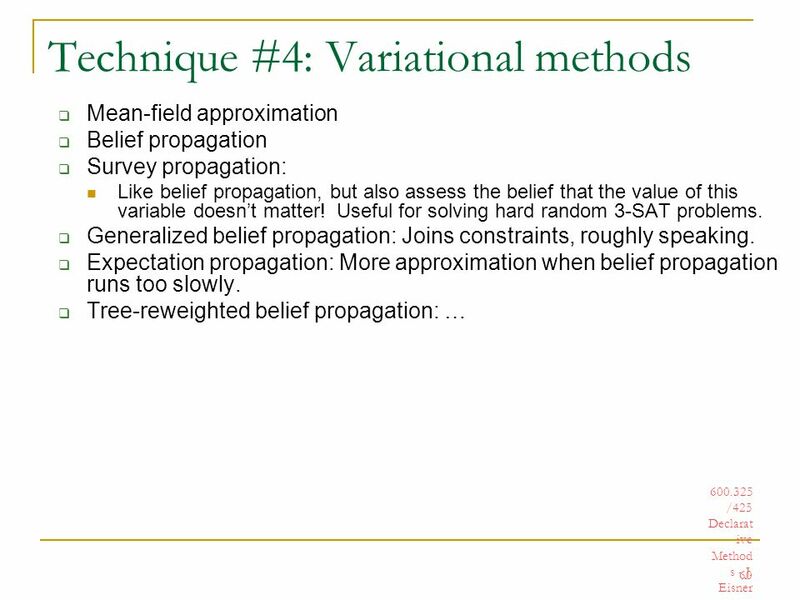 E.g., survey propagation is the current best method for random 3-SAT problems. Hot area of research! 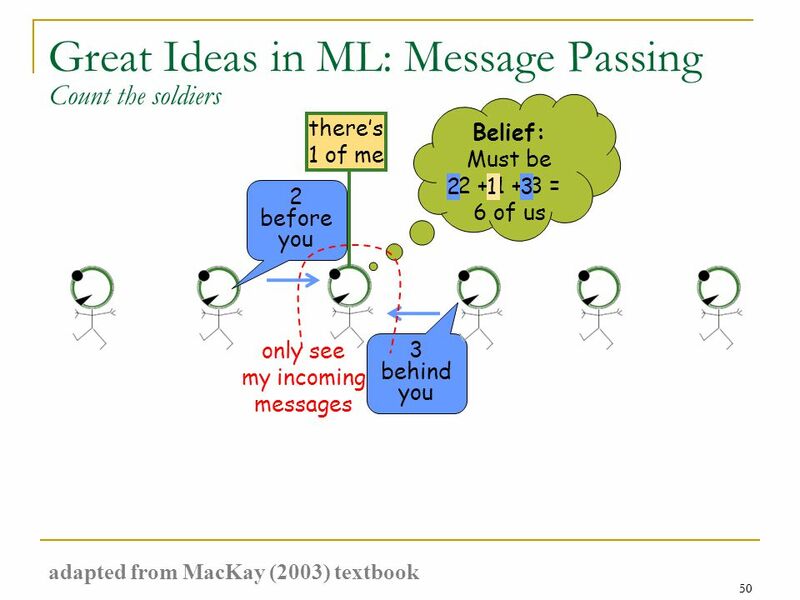 38 600.325/425 Declarative Methods - J. Eisner 38 Probabilistic interpretation  Learning How likely is it for (X1,X2,X3) = (1,0,1) (according to real data)? 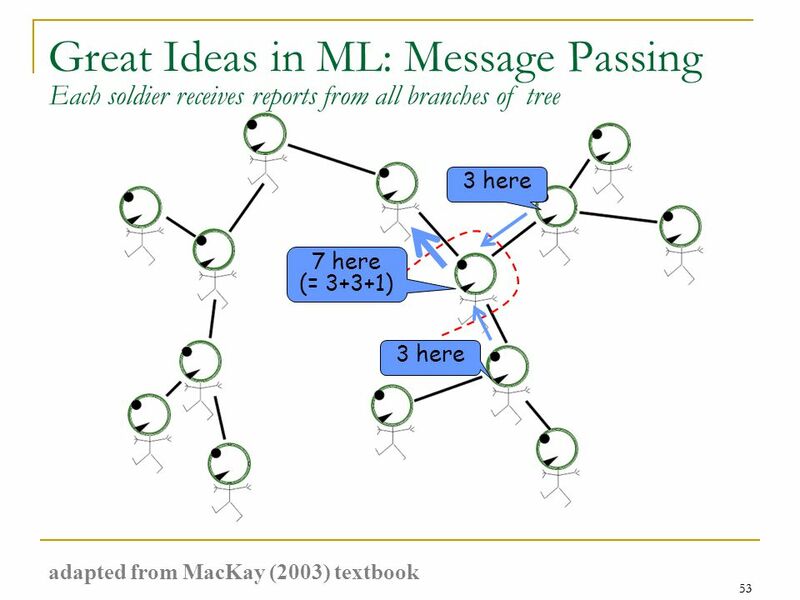 90% of the time How likely is it for (X1,X2,X3) = (1,0,1) (according to the full model)? 55% of the time  I.e., if you randomly sample many assignments from p(x), 55% of assignments have (1,0,1).  E.g., 55% have (Cold, ~Cough, Sneeze): too few. 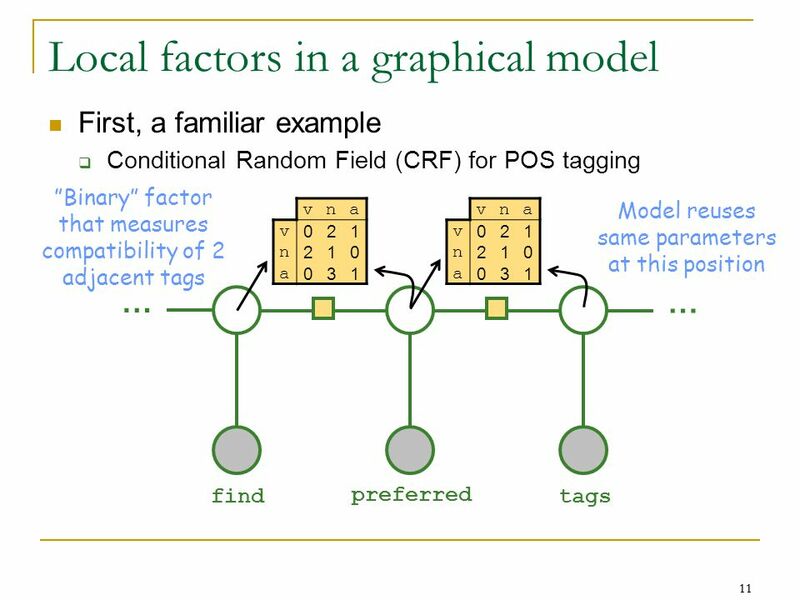 To learn a better p(x), we adjust the factor functions to bring the second ratio from 55% up to 90%. 39 600.325/425 Declarative Methods - J. Eisner 39 Probabilistic interpretation  Learning f1 How likely is it for (X1,X2,X3) = (1,0,1) (according to real data)? 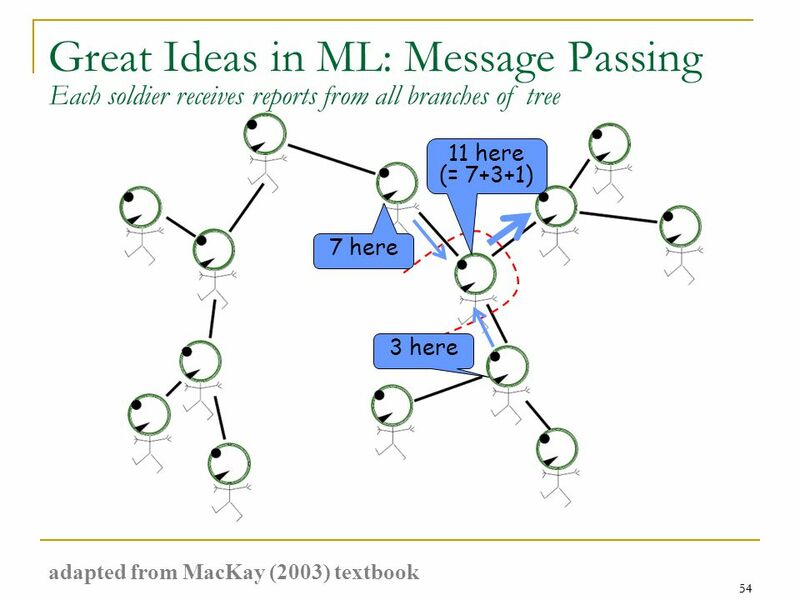 90% of the time How likely is it for (X1,X2,X3) = (1,0,1) (according to the full model)? 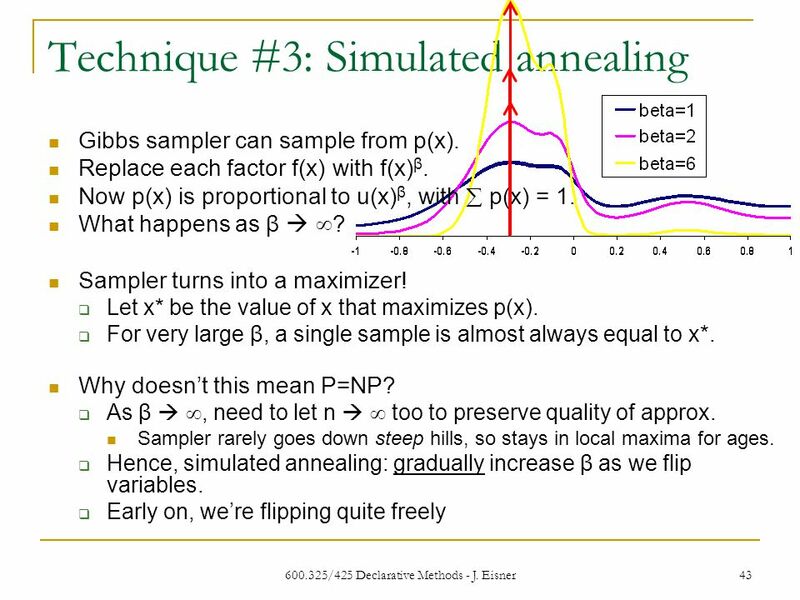 55% of the time To learn a better p(x), we adjust the factor functions to bring the second ratio from 55% up to 90%. By increasing f1(1,0,1), we can increase the model’s probability that (X1,X2,X3) = (1,0,1). 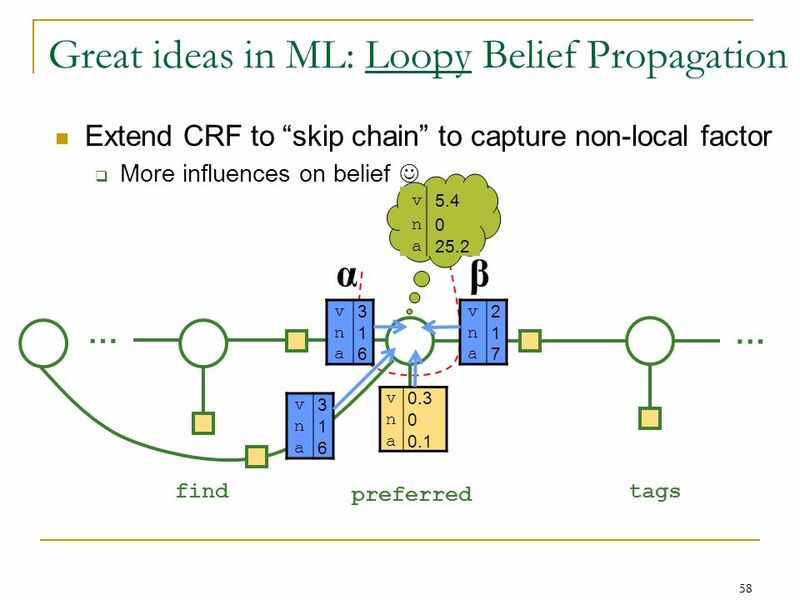 Unwanted ripple effect: This will also increase the model’s probability that X3=1, and hence will change the probability that X5=1, and … So we have to change all the factor functions at once to make all of them match real data. Theorem: This is always possible. (gradient descent or other algorithms)  Theorem: The resulting learned function p(x) maximizes p(real data). 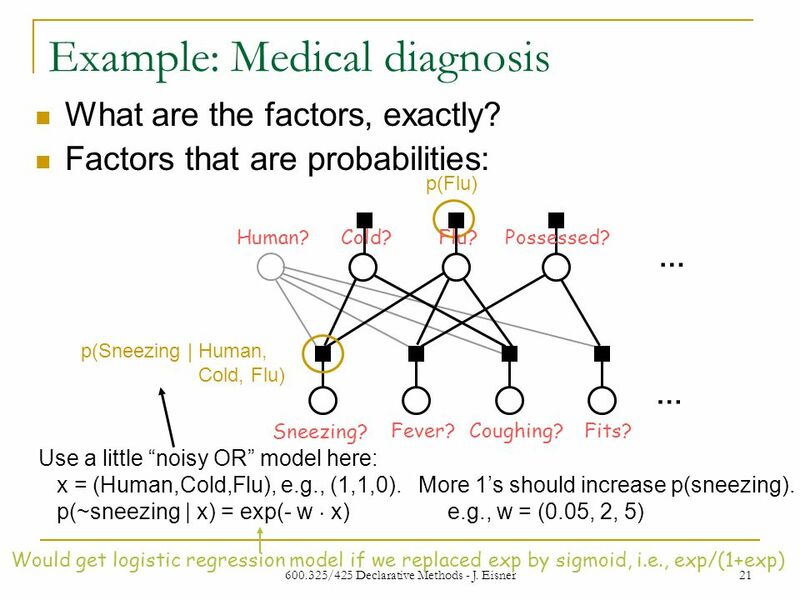 40 600.325/425 Declarative Methods - J. Eisner 40 Probabilistic interpretation  Learning f1 How likely is it for (X1,X2,X3) = (1,0,1) (according to real data)? 90% of the time How likely is it for (X1,X2,X3) = (1,0,1) (according to the full model)? 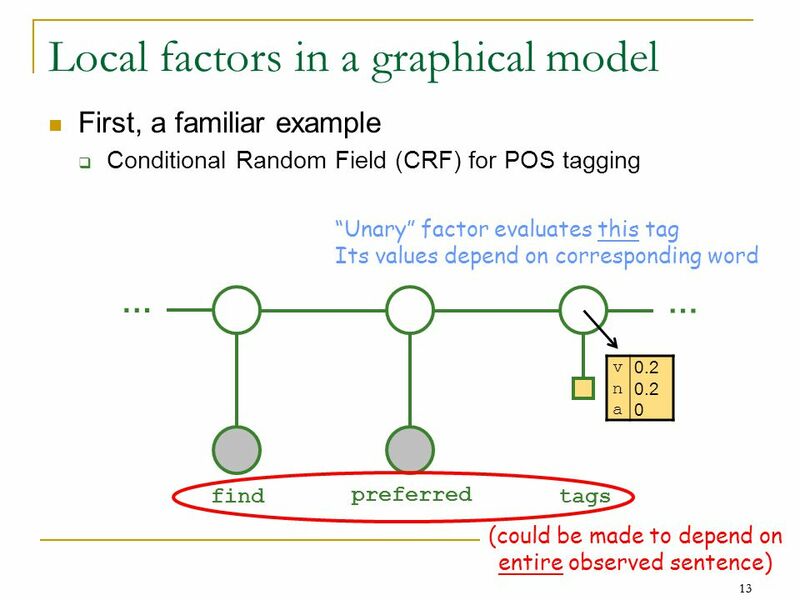 55% of the time To learn a better p(x), we adjust the factor functions to bring the second ratio from 55% up to 90%. 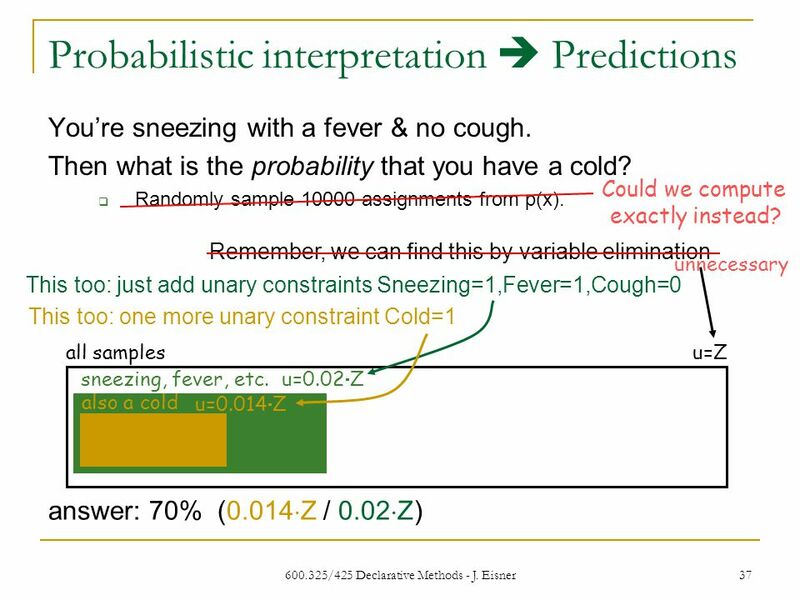 By increasing f1(1,0,1), we can increase the model’s probability that (X1,X2,X3) = (1,0,1). 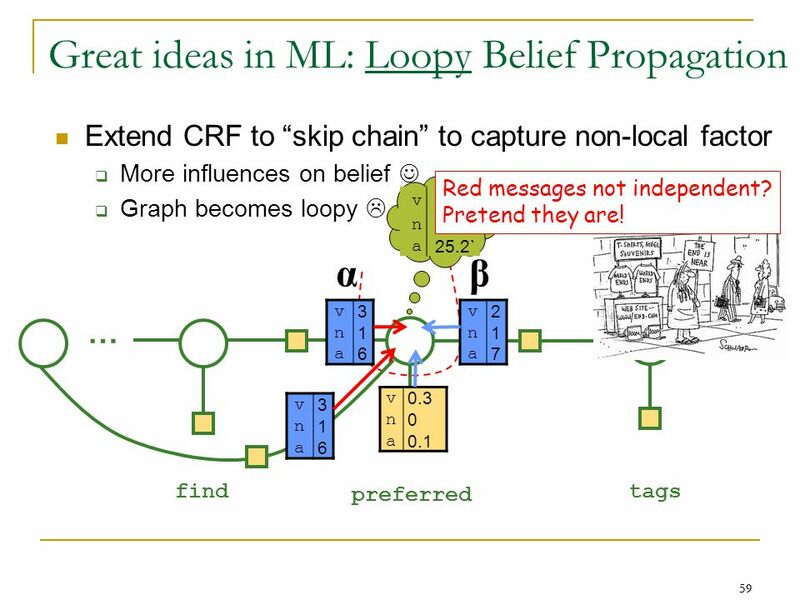 Unwanted ripple effect: This will also increase the model’s probability that X3=1, and hence will change the probability that X5=1, and … So we have to change all the factor functions at once to make all of them match real data. Theorem: This is always possible. 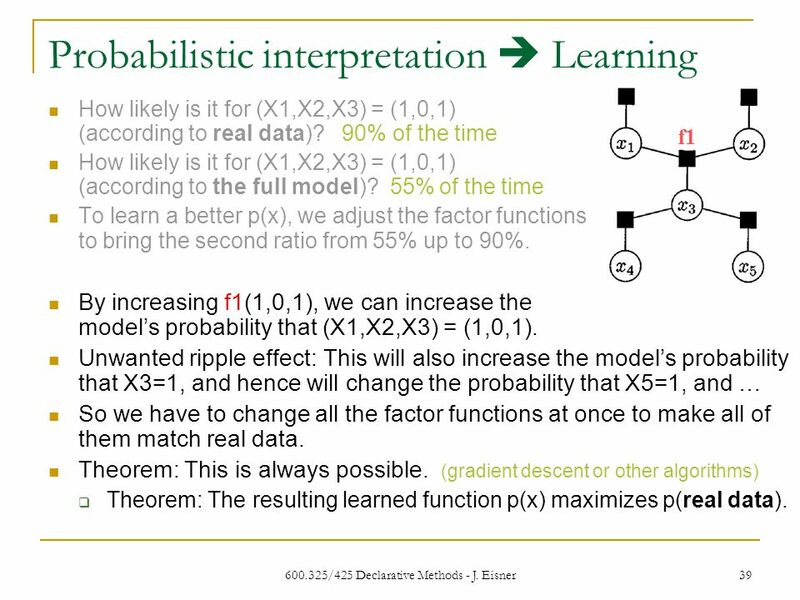 (gradient descent or other algorithms)  Theorem: The resulting learned function p(x) maximizes p(real data). 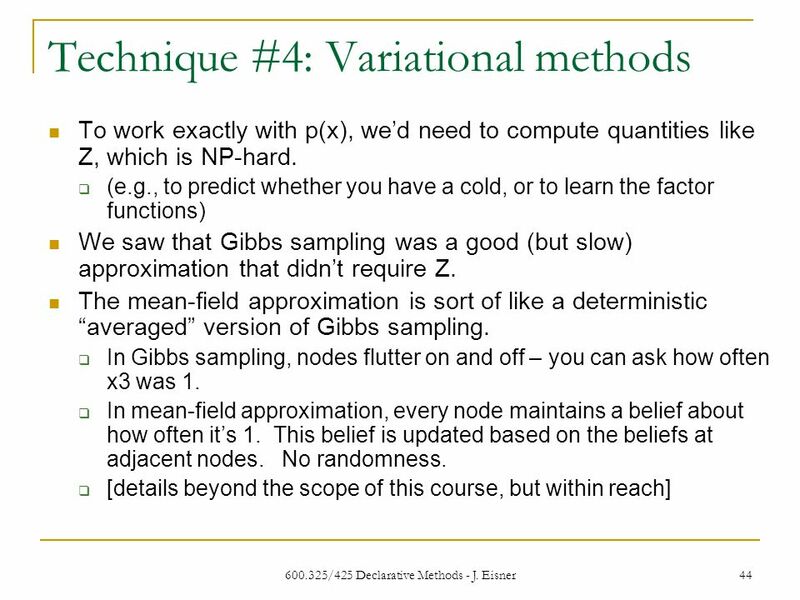 42 600.325/425 Declarative Methods - J. Eisner 42 1 How do we sample from p(x)? 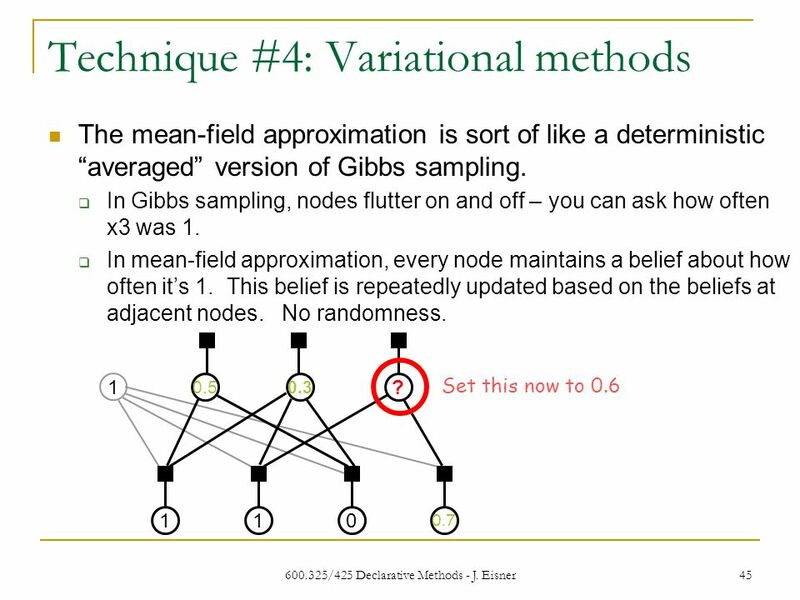 Gibbs sampler: (should remind you of stochastic SAT solvers)  Pick a random starting assignment. 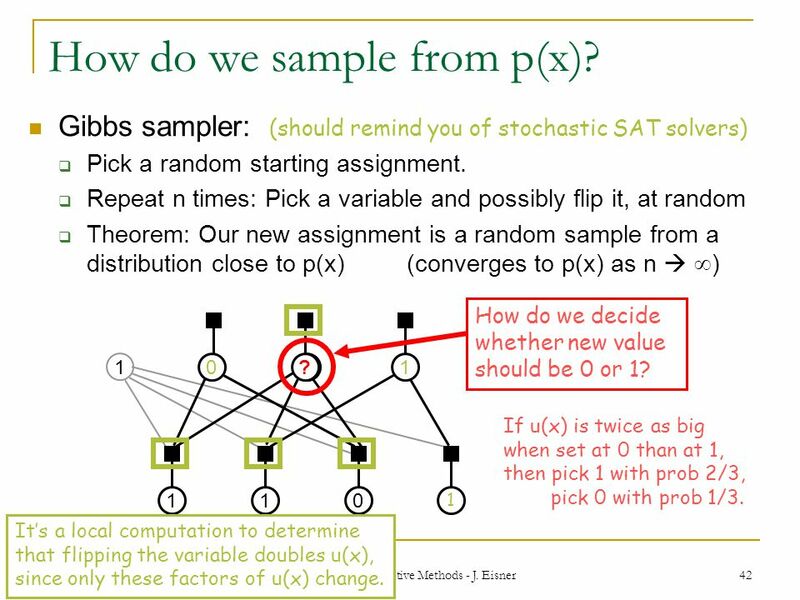  Repeat n times: Pick a variable and possibly flip it, at random  Theorem: Our new assignment is a random sample from a distribution close to p(x) (converges to p(x) as n   ) 1 110 1 ?10 How do we decide whether new value should be 0 or 1? If u(x) is twice as big when set at 0 than at 1, then pick 1 with prob 2/3, pick 0 with prob 1/3. It’s a local computation to determine that flipping the variable doubles u(x), since only these factors of u(x) change. 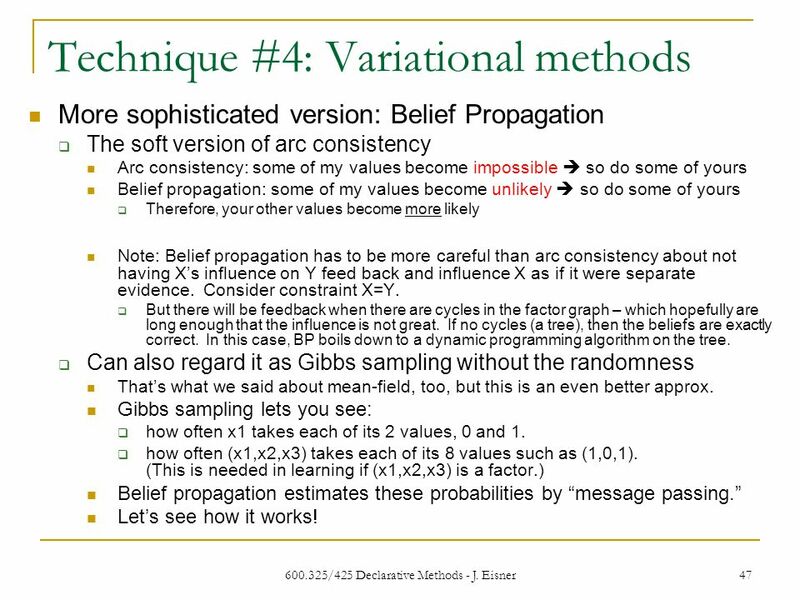 47 600.325/425 Declarative Methods - J. Eisner 47 Technique #4: Variational methods More sophisticated version: Belief Propagation  The soft version of arc consistency Arc consistency: some of my values become impossible  so do some of yours Belief propagation: some of my values become unlikely  so do some of yours  Therefore, your other values become more likely Note: Belief propagation has to be more careful than arc consistency about not having X’s influence on Y feed back and influence X as if it were separate evidence. 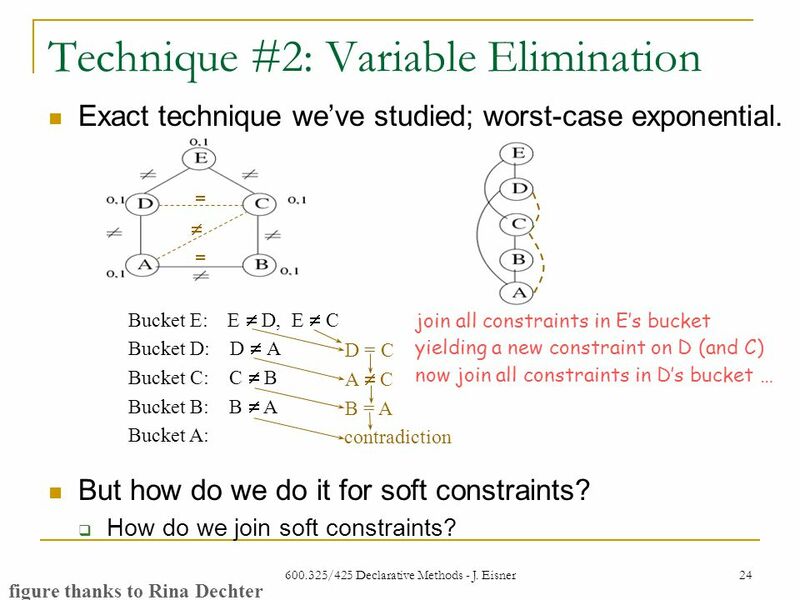 Consider constraint X=Y.  But there will be feedback when there are cycles in the factor graph – which hopefully are long enough that the influence is not great. 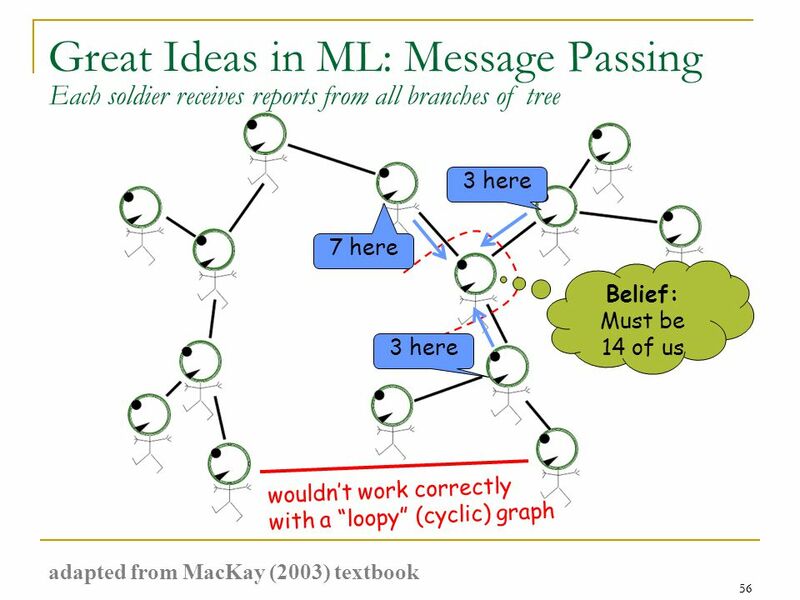 If no cycles (a tree), then the beliefs are exactly correct. 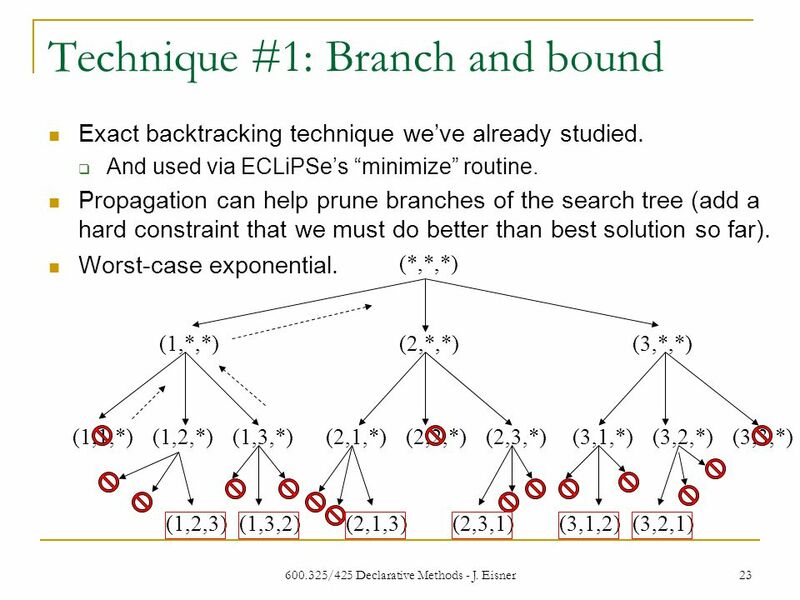 In this case, BP boils down to a dynamic programming algorithm on the tree. 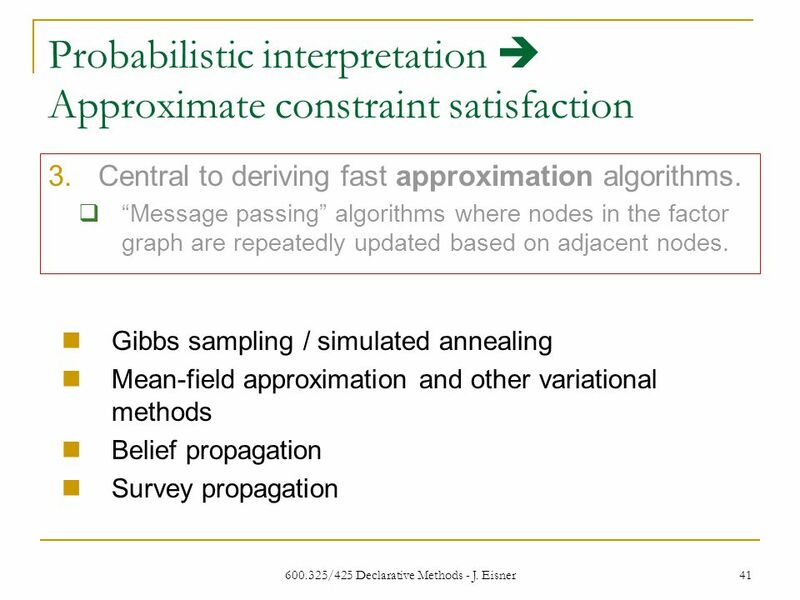  Can also regard it as Gibbs sampling without the randomness That’s what we said about mean-field, too, but this is an even better approx. 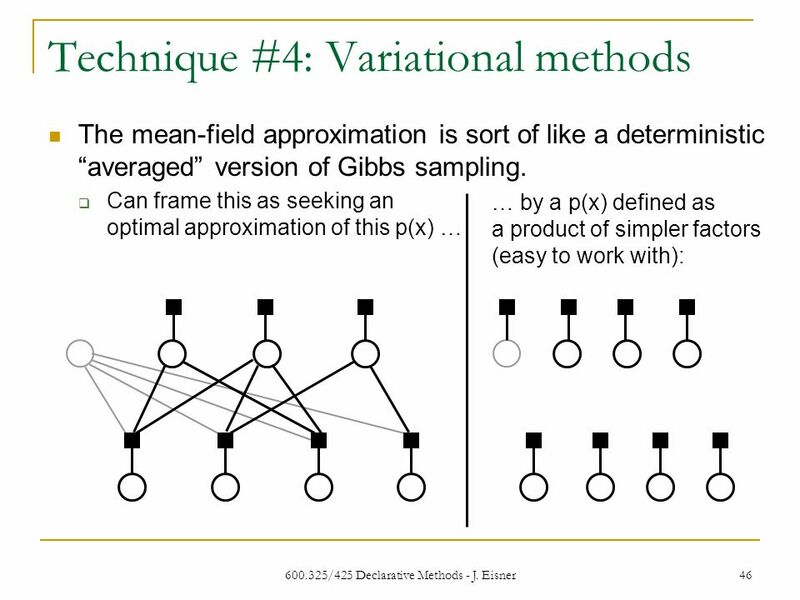 Gibbs sampling lets you see:  how often x1 takes each of its 2 values, 0 and 1.  how often (x1,x2,x3) takes each of its 8 values such as (1,0,1). 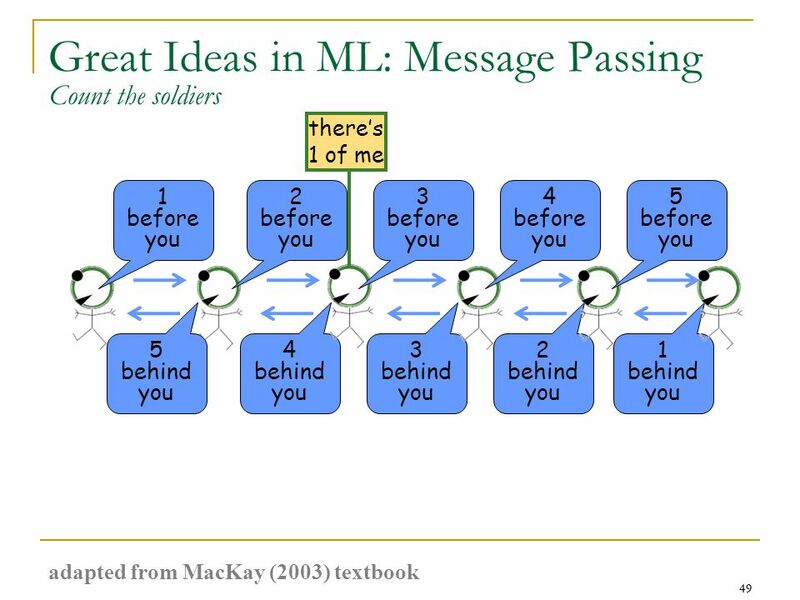 (This is needed in learning if (x1,x2,x3) is a factor.) 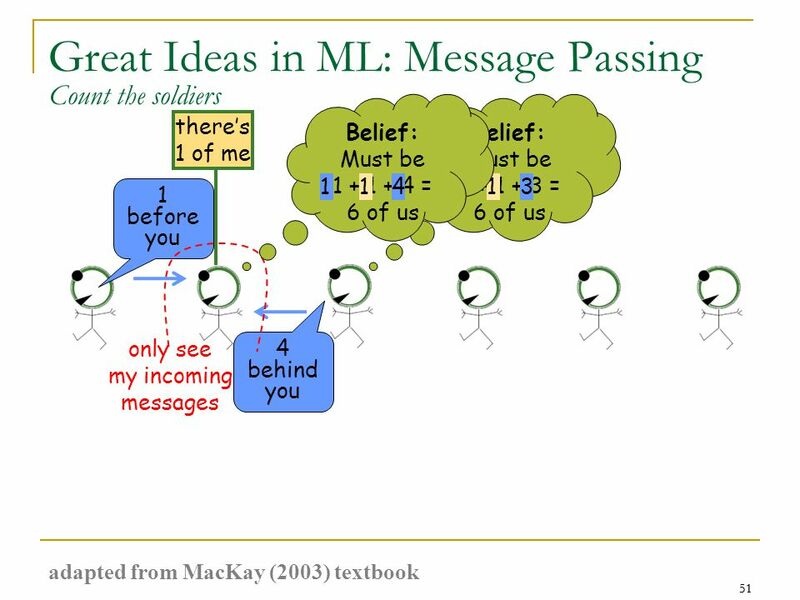 Belief propagation estimates these probabilities by “message passing.” Let’s see how it works! 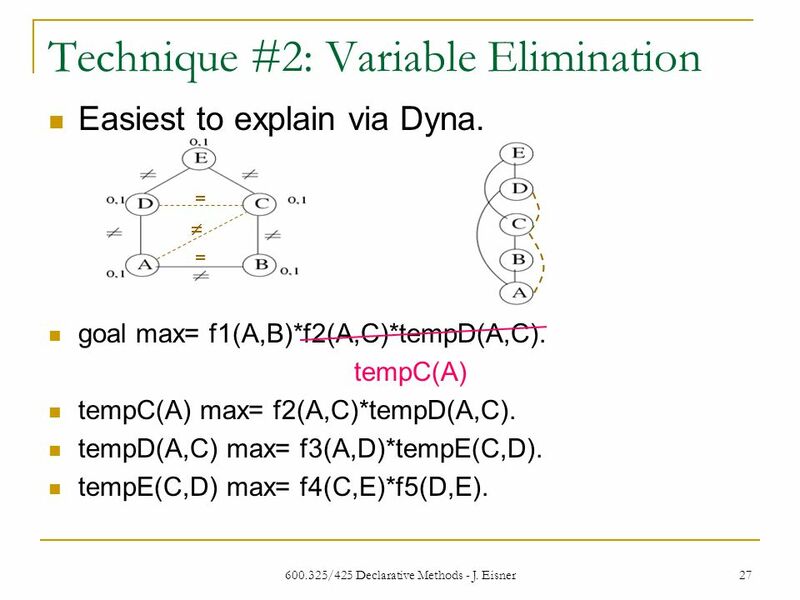 Download ppt "600.325/425 Declarative Methods - J. Eisner1 Soft Constraints: Exponential Models Factor graphs (undirected graphical models) and their connection to constraint."